TOKOROZAWA, SAITAMA PREF. - Yusei Kikuchi went nine innings, setting up an extra-inning win as Tomoya Mori’s pinch-hit sayonara double lifted the Seibu Lions to 2-1 triumph over the Orix Buffaloes on Thursday. Kikuchi lucked out of a one-out, bases-loaded jam in the second and then cruised until Koji Oshiro tied it 1-1 in the seventh with a two-out RBI single. The left-hander retired the last seven batters he faced and left having allowed seven hits and a walk, while striking out seven. Right-hander Deunte Heath (3-0), who joined Seibu this summer, worked around a leadoff single to pitch a scoreless 10th. He earned the win after Mori came off the bench to drive in Takeya Nakamura from second with a game-ending double. The win was the fourth straight for the Pacific League leaders, while Orix suffered its sixth straight loss. “Of course I went up thinking I wanted a hit, but with (leadoff hitter Shogo) Akiyama on deck, I thought even if I strike out, Akiyama could bring the runner home, so I was relaxed at the plate,” Mori said. The Buffaloes had a golden opportunity in the second, when they loaded the bases with one out. Catcher and No. 9 hitter Kenya Wakatsuki hammered a high fastball but did not hit it high enough to prevent shortstop Sosuke Genda from making a jumping catch. Orix starter Andrew Albers allowed the leadoff runner to reach in each of the first three innings, but kept the game scoreless until Shuta Tonosaki homered to leadoff Seibu’s fifth. Albers left after allowing a two-out walk and a single in the eighth inning. Right-hander Yoshinobu Yamamoto came into face Lions captain Hideto Asamura, who lined out to end the inning. After Kazumasa Yoshida pitched a scoreless ninth for the Buffaloes, closer Hirotoshi Masui (1-2) took the mound in the 10th and suffered the loss for the second straight game. 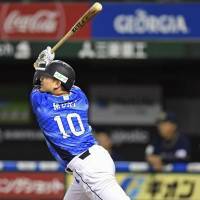 At Fukuoka’s Yafuoku Dome, Seiji Uebayashi’s two-out, two-strike, three-run home run capped a four-run ninth-inning comeback and Fukuoka SoftBank went on to beat Chiba Lotte in the 10th on Nobuhiro Matsuda’s walkoff RBI single. At Osaka’s Kyocera Dome, Yuhei Takai’s two-out, ninth-inning RBI single off Yomiuri’s Scott Mathieson brought Tokyo Yakult back from a 1-0 deficit, and Norichika Aoki doubled in the 11th and scored the winning run on Tetsuto Yamada’s walk-off RBI single. 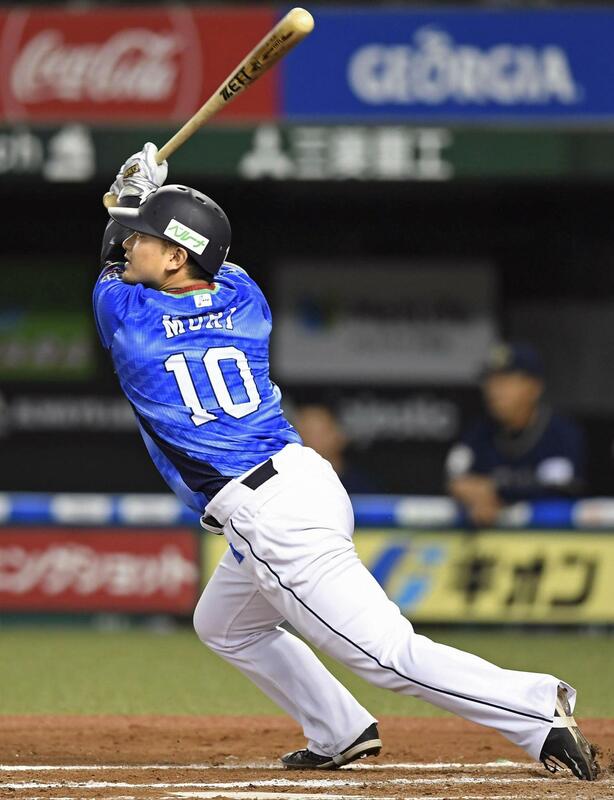 At Nagoya Dome, Neftali Soto continued his home run spree, homering twice and driving in three runs to lead Yokohama past Chunichi. Soto now has 15 homers on the season and seven in his past six games. At Koshien Stadium, Ryoma Nishikawa delivered the big first-inning blow, a three-run double, as league-leading Hiroshima hammered Hanshin starter Shintaro Fujinami for five runs in a third of an inning and never looked back.